The Accel Truck Super Tune-Up Kits have been engineered by the professionals at Accel to provide you with everything that you need to super tune your pickup, van, or SUV including a custom-fit Extreme 9000 wire set, a distributor cap, and race proven U-Groove spark plugs.These kits will deliver maximum burn efficiency for improved performance, reduced emissions and better fuel economy! Note: Some inline 6-cylinder applications use the 5000 Series Wire Set where extreme heat is not a concern. 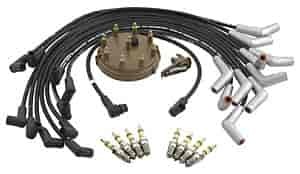 JEGS Easy Kits are designed by JEGS professionals so you get all the parts you need! Does Accel TST15 fit your vehicle?